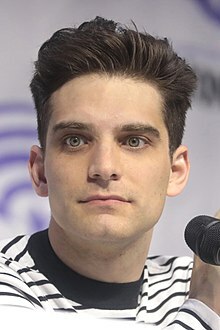 Jeff Ward (born December 30, 1986) is an American actor best known for his roles as Charles Manson in Manson's Lost Girls (2016), Seth Marlowe in Channel Zero: No-End House (2017), and Deke Shaw in Marvel's Agents of S.H.I.E.L.D. (2017–present). Jeff Ward was born in Washington, D.C., but grew up in Philadelphia where he began acting in theatrical productions. He has one younger sister who is a third grade teacher. Jeff attended Tisch School of the Arts along with fellow actor Miles Teller. In 2017, he starred as Seth Marlowe in the critically acclaimed horror anthology series Channel Zero: No-End House. Later in 2017, he was cast as Deke Shaw on the Marvel Cinematic Universe television series Agents of S.H.I.E.L.D. in a recurring role during season five. Originally he was cast as Virgil, a minor character who dies in the first episode of the season, but during the table read of the episode, the main cast felt that Ward "nailed it" as Virgil and wanted him to stay on as Deke, who had not yet been cast. After the reading, the producers reached out to Ward and offered him to audition for Deke, which ended in him ultimately being cast in the part. Ward was later promoted to series regular for season six and seven. 2005 Law & Order: Criminal Intent Darwin Mondale Episode: "In the Wee Small Hours: Part 1"
2014 Next Time on Lonny Giles Episode: "Lonny Goes for Broke"
Open Season Jonah Episode: "The Night Out"
2015 The Mentalist Matthew Stoppard Episode: "The Whites of His Eyes"
Rosewood Wyatt Montgomery Episode: "Hydrocephalus and Hard Knocks"
2017 555 Actor Episode: "Acting"
^ a b Losgar, Maxwell (February 5, 2016). "Jeff Ward Scared Himself Learning to Play Charles Manson". Vanity Fair. Retrieved November 26, 2017. ^ Petski, Denise (September 27, 2016). "'Channel Zero: The No-End House': Jeff Ward Cast As Male Lead In Syfy Series". Deadline. Retrieved May 12, 2018. ^ Petski, Denise (August 4, 2017). "'Marvel's Agents Of S.H.I.E.L.D. ': Jeff Ward Set To Recur In Season 5". Deadline. Retrieved November 26, 2017. ^ Brown, Tracy (July 25, 2018). "'Agents of S.H.I.E.L.D. 's' Jeff Ward explains how he was cast as Deke Shaw". Los Angeles Times. Archived from the original on August 4, 2018. Retrieved August 4, 2018. ^ Li, Shirley (July 21, 2018). "'Marvel's Agents Of S.H.I.E.L.D. ': Jeff Ward Set As Series Regular In Season 6". Entertainment. Retrieved January 29, 2019. ^ O'Connell, Michael (November 16, 2018). "'Marvel's Agents Of S.H.I.E.L.D. ': Jeff Ward Set As Series Regular In Season 7". hollywoodreporter. Retrieved January 29, 2019. Wikimedia Commons has media related to Jeff Ward (actor). Male actors from Washington, D.C. This page was last edited on 18 April 2019, at 19:07 (UTC).